Employment situation in Rajasthan has been influenced by rapid growth of population, agricultural fluctuations and slow industrial growth of state. The situation of underemployment and unemployment has been worsening with passage of time. However, before getting into the number and details, lets understand different aspects unemployment and how unemployment is measured. To most, the word, unemployed means being without work. Unemployment is defined as the condition of being unemployed, or, it refers to the number or proportion of people in the working population who are unemployed( have no jobs). An unemployed person is one who is an active member of the labour force and is able to and seeks work, but is unable to find work during a specified reference period (a week or a month or a year). The unemployment rate is the ratio of the number of unemployed persons in the labour force per thousand. This kind of unemployment occurs when there is any change in consumer demand and technology in the economy. For instance, when computers were introduced, many workers were dislodged because of a mismatch between the existing skills of the workers and the requirement of the job. When there is an economy-wide decline in aggregate demand for goods and services, employment declines and unemployment correspondingly increases. 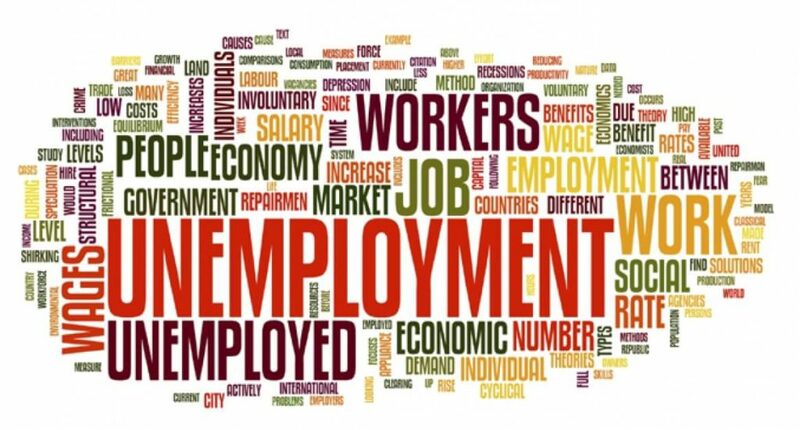 This type of unemployment refers to a transition period of looking for a new job, for different reasons, such as seeking a better job, being fired from a current job, or having voluntarily quit a current job. The period of time between the current to a new job is referred to as frictional, or temporary unemployment. A type of frictional unemployment, occurs in specific activities or occupations which are characterized by seasonal work. Open unemployment arises when a person, voluntarily or involuntarily, keeps himself or herself out of consideration for certain jobs. The condition of those who work part time because fill time jobs are unavailable or employed on a full time basis but the services they render may actually be much less than full time. Who are employed in occupations requiring lower levels of skills than they are qualified for. Those who actually work long hours but earn only a low income below the poverty line. I. e. in spite of being employed, remain in relative poverty due to low levels of wages and earnings. NSSO uses the concept of ‘Usual Principal Status’ (UPS) as a time reference period for identifying workers. NSSO uses three reference periods to describe the activity status of a worker. These reference periods are – a year, a week and a day. 1.UPS Criteria: On basis of UPS of people, a person is known to be employed if he or she was engaged in an economic activity for a longer period of time (183 days or more) in 365 days. ‘Subsidiary Status’ – A ‘subsidiary status worker’ is that worker who was engaged in an economic activity in a subsidiary capacity during the reference period. UPS, UPSS, CWS – overestimate employment because of the way they are defined. ‘Current Daily Status’ (CDS) – this refers to the number of persons who did not find work on a day, or on some days, during the survey week. CDS employment measures the rate of utilisation of the labour force in terms of person-days. While the first three measures overestimate, to some extent, levels of employment because of the way they are defined, the CDS measure gives a closer estimate of these levels.